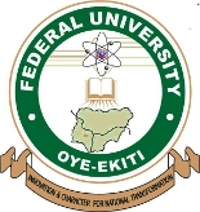 Federal University Oye Ekiti, FUOYE Top-Up (Degree and HND Conversion) Programme Admission Form, Available Courses, Objectives, Admission Requirements, Application Guidelines, Tuition/School Fees for 2018/2019 Academic Session. Authorities of the Federal University Oye Ekiti, FUOYE invites application from qualified candidates for admission into the Top-Up (Degree and HND Conversion) Programme for 2018/2019 academic session. HND graduates desirable of University first degree. Graduates with Interest In career change (e.g. graduate of Chemistry wishing to change career to Accounting, etc). Applicants must possess a minimum of five(5)O’Level subjects at credit level In relevant subjects In not more than two(2)sittings in the subjects relevant to their proposed programmes. English Language at credit level is compulsory for all candidates. In addition, credit in Mathematics Is compulsory for candidates seeking admission into Programmes in the Faculties of Engineering, Sciences and social Sciences. Minimum of Third Class Honors or Pass degree or HND certificate from a recognized institution is required for conversion programme. Completion or exemption from the mandatory National Youth Service Corps (NYSC) Scheme.